Welcome back to the blog of Rogers & Andrews Orthodontics! In our last post, we took the opportunity to highlight what it is about our local orthodontist office that sets us apart from other orthodontists in the Augusta and Thomson regions of Georgia. We won’t belabour the point, but we will say you should check out our last blog if you are interested. What’s more, our last post was part one of this two-part series in which we highlight a few important oral health care tips related to brushing, flossing, and the like. In part one, we discussed how often we encounter folks who do not brush correctly (let alone often enough). Again, please go back and read part one — your teeth and tongue will thank you in the long run — but for the purposes of this post, we’ll leave those tips in the past since we have new ones to highlight in part two! Floss (Seriously, Floss) – We would surmise that a great number of people don’t heed the words of their dentist in reference to flossing because the practice wasn’t ingrained in them as children. 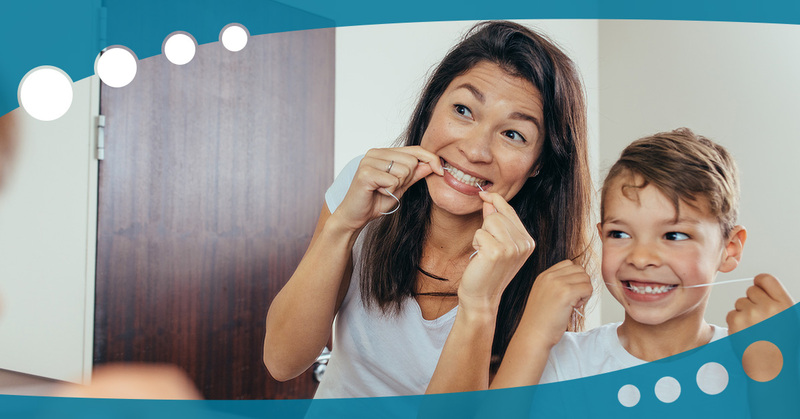 Most people’s parents didn’t floss, so they didn’t ensure that their children did, and here we are in 2019 with only 30 percent of Americans flossing daily, according to U.S. News. While some people floss every-so-often, what these in-betweeners don’t realize is that flossing is just as important as brushing. Imagine failing to brush but once a week and simply shrugging about it? Floss Daily – We hate to overdo it, but because so many Americans are seriously under-doing it, we are compelled to. Flossing is critical not because it releases bits of food trapped between your teeth (although that’s quite helpful), but because it gets the tough-to-reach plaque lodged between teeth, helps reduce inflammation, and even stimulates the gums so that they will be stronger. Do you want to be among the 70 percent of adults over 65 who have periodontal disease (gum disease)? We don’t either. That’s why we floss! Eat Fresh, Crunchy Foods For Better Oral Health – It might sound a bit strange at first glance, but eating crunchy produce, like apples, is a great way to keep your teeth relatively clean throughout the day. Not only are fresh, crunchy foods usually high in fiber, but choosing them instead of processed foods will strengthen your jaw as well. We recommend focusing on including these types of foods in your young children’s diet whenever possible. Use A Moderate Amount Of Fluoride – The rule of thumb here is to be like Goldilocks — not too much fluoride, and not too little either. If you live in the United States, however, you are likely already getting enough fluoride through your drinking water alone! Almost all toothpastes contain fluoride as well, which is used to strengthen the enamel of teeth, making them more resistant to natural decay. Make sure your children don’t use too much toothpaste (if it does indeed contain fluoride) because an excess of fluoride is unhealthy in young ones. Practically speaking, we’d recommend squeezing a dab out onto their toothbrush that is no larger than a pea. Change Your Toothbrush Out Once Every Few Months – Your toothbrush should be swapped out for a new one three or four times every year. Enough said! Drink More Water – Most people have heard that they need to drink more water than they already do, but have you ever read why it is beneficial for your teeth in particular? It’s because most water in North America is fluoridated, which means that drinking it will help reduce tooth decay by a minimum of 25 percent. Use Mouthwash – It doesn’t have to be every day, but we’d suggest beginning to incorporate mouthwash into your oral care routine. While many people might think of mouthwash as superfluous, there exists plenty of rationale behind the idea. Mouthwashes are useful to cleanse those difficult-to-reach areas that perhaps not even flossing can get to. What’s more, most mouthwashes will remineralize the teeth, making them stronger and healthier in the long run. We hope you’ve enjoyed this two-part series addressing brushing, flossing, and daily oral care in general. We also hope that you don’t feel overwhelmed by the obligation to start doing all of these things at once. Add one or two to your routine each week and see how it goes — starting with flossing! Rogers & Andrews Orthodontics has been making handmade smiles since 1973. We have a passion for helping folks who need orthodontic care of any kind. Whether you or your child need braces, you are looking into Invisalign, or you aren’t sure what kind of service you need, we can help. If you are looking for an orthodontist in Augusta or Thomson, reach out to us to schedule your appointment with Rogers & Andrews Orthodontics! We’d love to hear from you!